Short Walk to Crescent Beach on Siesta Key! Drop your socks and grab your Croc's (and bathing suits). That's all it takes to get to it all from this fabulous 2nd story condo. Perfect location for the perfect vacation. This is less than a half mile walk to Siesta Key Beach for a great day of fun in the sun. 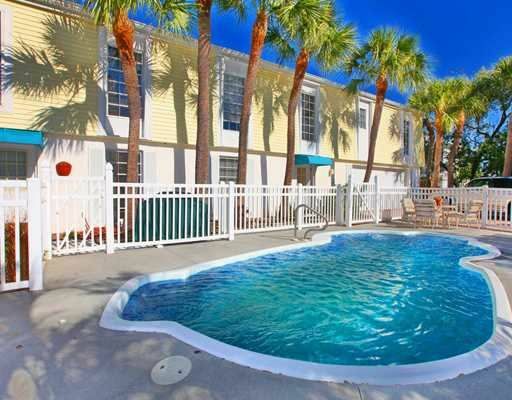 After walking in the sugary white sands of Siesta Key beach come back and take a cool dip in your private pool. A night out on the town is a must, with the endless shops and restaurants minutes away. I was born in Sarasota and own and operate an auto repair shop. (over 30 yrs.) I love spending time on/under the water. My daughter, Jennifer, manages this property. We have friends and family in Sarasota who will be renting from us so we have made this a place we would rent to any of them. I really like the pool and the short walk to the beach to watch the sunset. Very nice quiet area not to far from beaches. The 2nd floor unit was clean and comfortable. The unit was well supplied with amenities. The pool is small, so be prepared to share it with guests in the 1st floor unit. This is the perfect place to spend time with family .the condo is very private and well equipped. The location is also very good.The area feels very inviting and safe.There is all sorts of stores if needed too.I would recommend it to others for sure! It was really clean and everything is in the condo. It full equip. We loved staying at your condo. It was super clean and very cozy. We loved how close to everything it was! We will be coming back to use your condo again.